The speaker amplification system in the sanctuary and the Fellowship Hall includes an induction loop system. If you have an assistive listening device, please turn it to the T-position or see your audiologist for help. You can also use one of our discrete over-the-ear systems for free, just ask an usher. 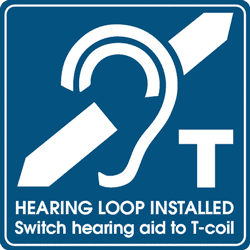 If you don't use a hearing aid (or have a hearing aid that doesn’t have T-coil capability) we have also have loop receivers with an ear-piece, just like a Walkman; just ask the usher for one as you come in. Using the loop receiver is easy: put the lanyard over your head so the loop receiver is oriented vertically in front of you, slip the ear-piece on your ear, and then adjust the volume. The red light on the loop receiver lets you know everything is working correctly. All of the pews in the Sanctuary are in the coverage zone, so you can sit wherever you like. 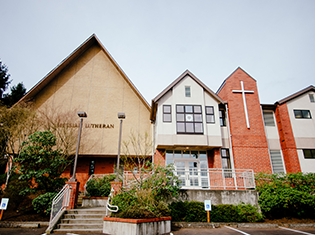 The coverage also extends to the Fellowship Hall, so be sure to turn on your T-coil for Education Hour, AIC, and congregational meetings, too. 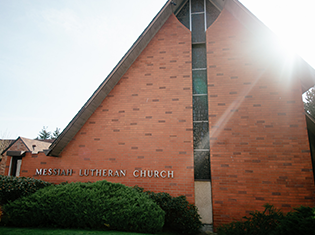 Parking is available at the rear of the building in the lot sandwiched between Messiah Lutheran and Concordia Lutheran School. 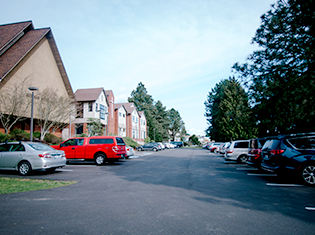 To access, take NE 70th Street east of 35th Ave NE and turn left on 36th Ave NE (the first side street). Continue to the end of the block and it will curve onto our parking lot.